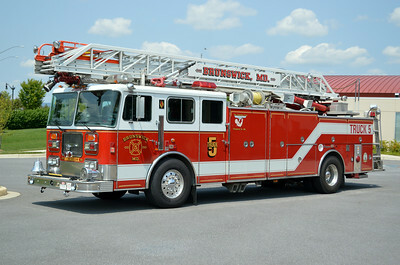 Brunswick Fire Company - Frederick County Station 5. 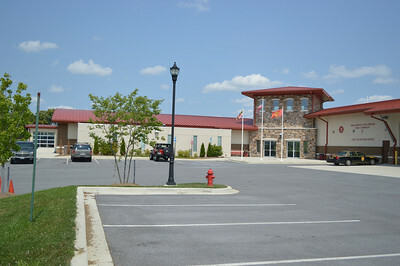 Brunswick often runs mutual aide with Lovettsville Company 12 in Loudoun County, Virginia. 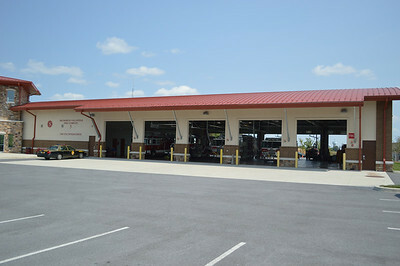 Apparatus bays at Station 5. Engine 51 is this compact 1997 Pierce Saber, 1500/1000, sn- EA661. 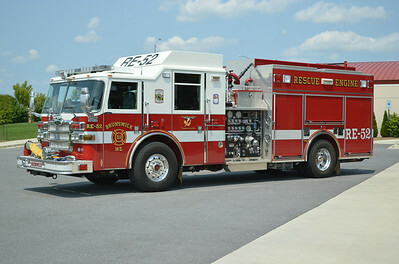 Rescue Engine 52 is a 2007 Pierce Dash, 1500/650, sn- 18920. 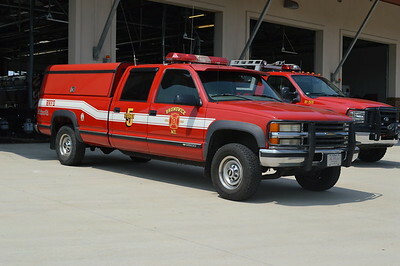 This nice 1994 Seagrave JR-06-DH, 100', sn- 75689 is Truck 5. 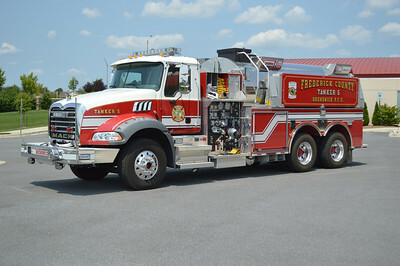 Tanker 5 is a Frederick County owned unit, a 2010 Mack Granite/Pierce, 1500/3000, sn- 22836. This 2006 Ford F-350/Knapheide/Fast Attack skid, 250/200 is Brush 55. 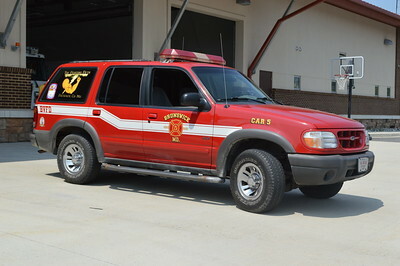 Car 5 is a Ford Explorer. Last from Brunswick is Utility 5, a Chevy Silverado 3500. 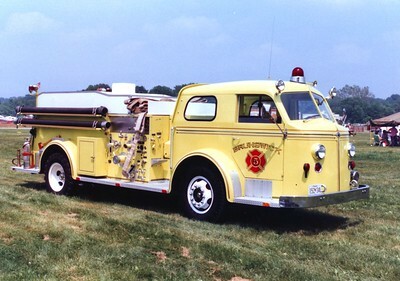 Brunswick's former Engine 53, a 1953 American LaFrance 700, 750/1000. 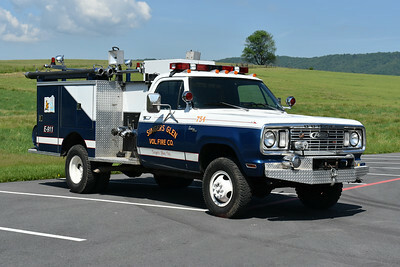 Former Engine 751 from Singers Glen, a beautiful 1973 GMC 7500/Oren/1999 FD, 750/800, sn- 3371. ex - Brunswick, Maryland. To Singers Glen in 1993. 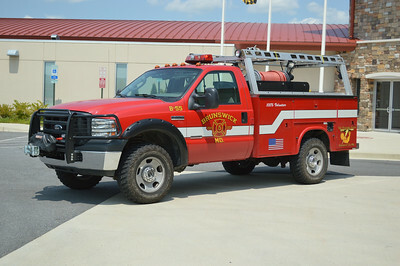 Ex- Attack 754 from Singers Glen was replaced in 2018 with the delivery of a new truck. 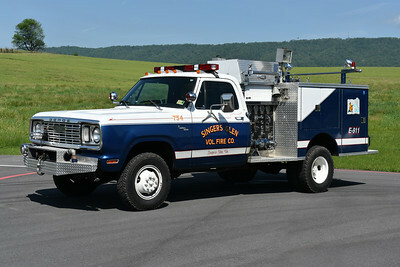 This 1978 Dodge Custom 400 4WD/Pierce was originally delivered to Glen Rock, Pennsylvania. It was sold in 1990 to Brunswick, Maryland, painted red and white. 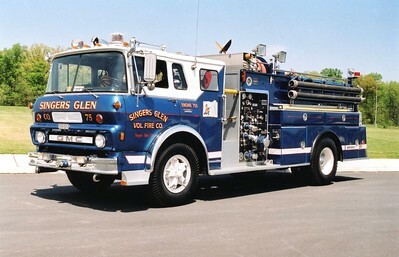 In 1996, Singers Glen received it and had it painted in the blue and white. 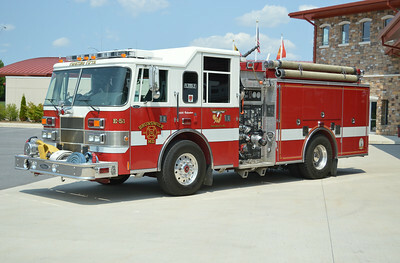 400/250 with Pierce job number 7521-D.
Another view of ex- Attack 754 from Singers Glen, VA.